Staša had the desire to travel and explore the unknown since a young age and jumped at the chance to spend a year of high school as an exchange student in Minnesota, USA. Her love for travel and the outdoors came as naturally as her candor. When in Slovenia she indulges it by hiking in the Julian Alps, cycling the challenging hairpin turns of Vrsic pass, relaxing on the shores of dreamy Dalmatia and enjoying the dolce vita of neighboring Italy. Abroad, her travels took her hiking in the mountains of Nepal, dancing salsa on streets of Santiago de Cuba, searching for Cuidad Perdida in Colombia and walking the steps of Mayan pyramids in Central America. She started working as a tour guide in college and even though she now holds a master’s in PR and marketing her love of travel and exploration always leads her back to working in tourism. When not out in the field, Staša takes care of every detail of our future adventures at our “basecamp” in Ljubljana. She’s fluent in six languages and her skills are as varied as her interests, so don’t be surprised if she waxes lyrical about the finer points of Slovenian cultural history while fixing your bike’s flat tire. Although she’s seen much of the world and explored the hidden corners of her back yard her bucket list is nowhere near done and she continues to explore beautiful destinations either in her free time or professionally as a tour guide. 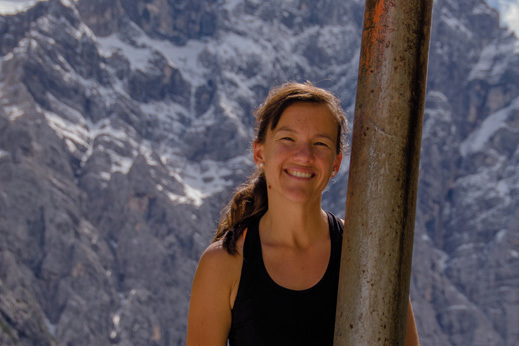 Stasa lives life to the fullest by doing what she loves most: adventure travel!